The Medical College of Wisconsin-Green Bay campus is located in the new $39 million Gehl-Mulva Science Center at St. Norbert College. The Medical College of Wisconsin-Green Bay campus is located in the Gehl-Mulva Science Center at St. Norbert College. The facility houses the MCW’s community medical education program with classrooms, administrative offices and learning laboratories. The expansion of the Medical College of Wisconsin (MCW) into Green Bay is in response to projections of a significant physician shortage in the state over the next 20 years. The new St. Norbert-based program will be embedded throughout the Green Bay community. MCW is seeking to utilize the clinical simulation center at Bellin College in Green Bay. Future plans include the development of inter-professional training programs for MCW’s medical students and Bellin College’s student health professionals. MCW worked with its academic partners in the Green Bay region – St. Norbert, the University of Wisconsin-Green Bay and Bellin College – and area medical facilities to identify science faculty members for the medical education program. The medical college works with faculty at St. Norbert and other local academic institutions to create medical-school pipeline programs for qualified undergraduate students interested in pursuing a career in medicine. 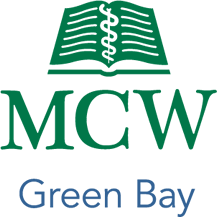 For complete information about MCW-Green Bay, visit the Medical College of Wisconsin website. MCW-Green Bay is No. 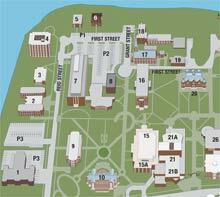 7 on the campus map. Visitors to MCW-Green Bay should park in visitor lots P-2 or P14.